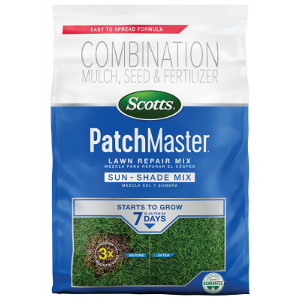 Improved Scotts® PatchMaster® Lawn Repair Mix Sun + Shade Mix has everything you need to repair bare spots in your lawn. 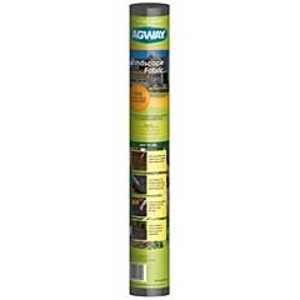 It includes seed, 100% recycled mulch to keep the seeds moist during establishment, and fertilizer to help feed seedlings for up to 6 weeks for fast growth and thick results. Backed by Scotts® No-Quibble Money Back Guarantee™. 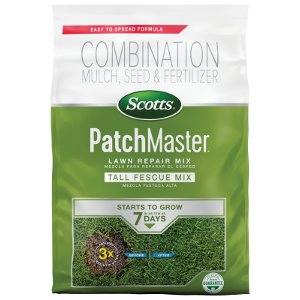 Improved Scotts® PatchMaster® Lawn Repair Mix Tall Fescue Mix has everything you need to repair bare spots in your lawn. 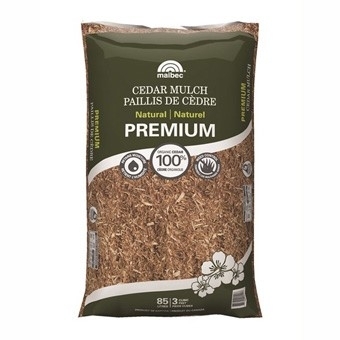 It includes seed, 100% recycled mulch to keep the seed moist during establishment, and fertilizer to help feed seedlings for up to 6 weeks for fast growth and thick results. 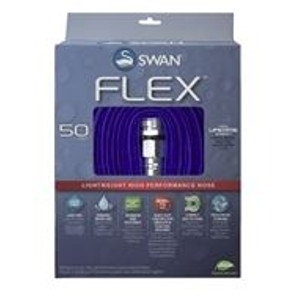 Backed by Scotts® No-Quibble Money Back Guarantee™. 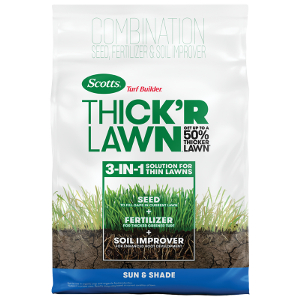 Scotts® Turf Builder® Thick'R LawnTM Sun & Shade has everything you need to help turn weak, thin grass into a thick, green lawn. 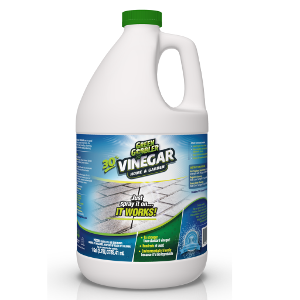 With this 3-in-1 solution, get up to a 50% thicker lawn with just one application*, guaranteed! Thick'R LawnTM contains soil improver for enhanced root development, seed to fill gaps with new grass, and fertilizer to feed new grass and thicken and green existing turf. 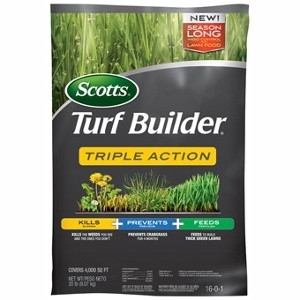 This product is intended for use on an entire lawn and can be applied easily with a Scotts® spreader. Sometimes it takes time to get your lawn moving in the direction you want. But with Scotts® Turf Builder® Starter® Food for New Grass Plus Weed Preventer, you don’t have to wait. 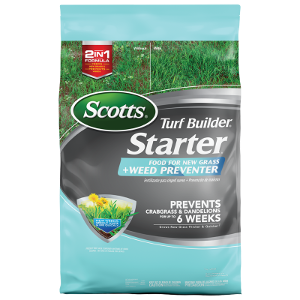 Starter® Food for New Grass Plus Weed Preventer has a 2-in-1 formula that feeds new grass and gives it a quick start, while preventing crabgrass and dandelions for up to 6 weeks. New grass grows thicker AND quicker versus unfed grass, which will have you on your way to the lawn you’ve always wanted. Faster. 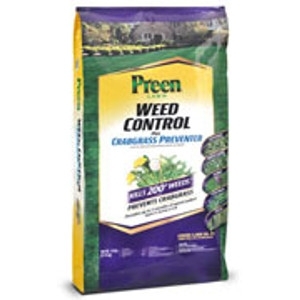 Preen Lawn Weed Control Plus Crabgrass Preventer provides up to 5 months of weed control. 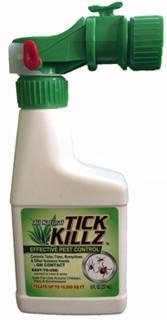 This product kills over 200 broadleaf weeds like dandelions, clover, ground ivy, thistle, and chickweed, and prevents crabgrass and other undesirable annual grassy weeds. Formulated to be effective with cool and warm season grasses, Preen Lawn Weed Control Plus Crabgrass Preventer can be applied in spring or fall. Cool season grasses: Kentucky bluegrass, perennial ryegrass and fine and tall fescue. Warm season grasses: Bahaigrass, Bermudagrass, buffalograss, centipedegrass, zoysiagrass, St. Augustinegrass (except ‘Floratam’). 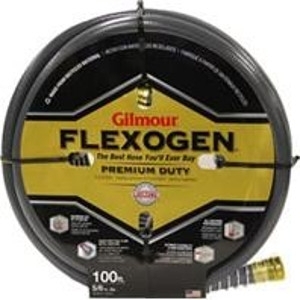 Do not use this product on seedling buffalograss in the spring of the first year of establishment until the turfgrass is fully green and has established new roots. Enjoy a weed-free vegetable garden without all the work. 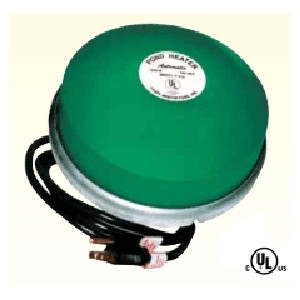 Preen Natural Vegetable Garden Weed Preventer is the natural way to keep weeds from sprouting! Use the natural weed control in your fruit, vegetable, herb, and landscape beds anytime during the growing season to save time from back-breaking weeding. 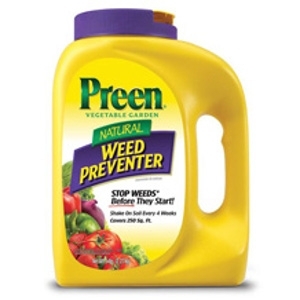 Preen Natural Vegetable Garden Weed Preventer is formulated to control some of the toughest weeds, like clover, bluegrass, crabgrass, foxtail, lambsquarters and plantain. Because it's 100% natural, you don't have to worry. Just sprinkle around established vegetables, herbs, and fruits once a month to prevent weeds from returning to your garden. 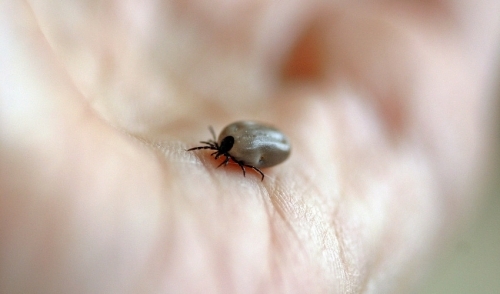 Children and pets can play in the area immediately after application. Model Number: AMES Companies, Inc. 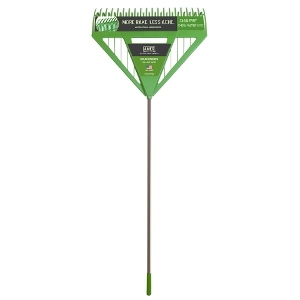 This AMES innovative leaf rake is ideal for people who want to rake faster! The dual tines allow for a clean sweep as they quickly rake through grass and leaves. 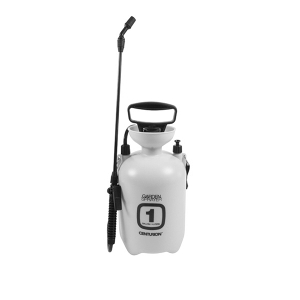 The head size is designed for jobs big and small, while the handle features a comfort grip texture for better control. 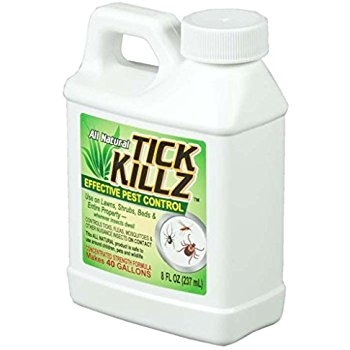 Tick Killz is an All Natural tick control product, made with 100% Organic ingredients, that will eliminate not only ticks, but mosquitoes, fleas and gnats as well. 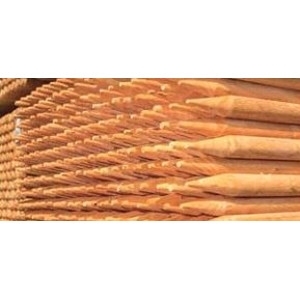 Douglas Fir Garden and Tree Stakes are sturdy, straight, strong and economical. 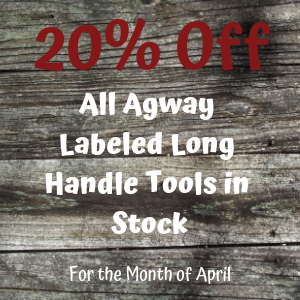 They are the perfect solution to staking trees without detracting from your landscape. These Fir Stakes are also the most handsome and economical way to drive posts to attach wire or mesh fencing for gardens and raised beds farming. They also are the sturdiest tomato stake or vine growers ever. Horticultural mulch is one of the easiest ways to improve the appearance of any garden. Mulch prevents the growth of weeds and retains moisture in the soil. 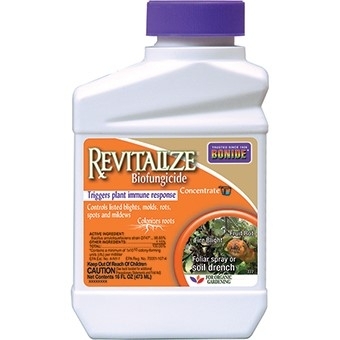 A high potency biofungicide/bactericide that controls blight, molds, rots, spots and mildews on vegetables, fruits, nuts, ornamentals, lawns, houseplants and tropical plants grown inside and out. 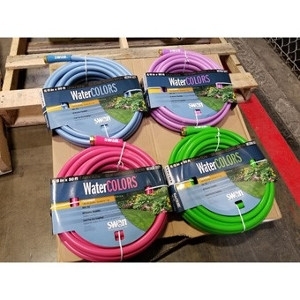 This organic gardening product may be used right up to the day of harvest.